The island of Ischia, specifically the town of Casamicciola, was struck by a devastating earthquake on July 28, 1883. It is difficult to give the precise seismic intensity of the event since at that time the Mercali scale was commonly used. It is not an open-ended measurement of intensity such as the Richter scale or the more recent Moment Magnitude Scale; the Mercali scale runs from 1 through 12 and measures environmental effects, with 1 being "barely noticeable even to people on the scene" to 12, described as "total devastation." The Casamicciola quake was assigned a magnitude of 10, where "Many well-built structures are destroyed, collapsed, or moderately to severely damaged. Most other structures are destroyed, possibly shifted off foundation. Large landslides." The Annali di Geofisica (vol. XXXVIII, n. 5-6, November-December 1995) contained the article "Earthquake, GIS and multimedia. The 1883 Casamicciola earthquake" by Bramieri, F. et al. that noted "...the [Casamicciola] earthquake was characterized by the maximum amount of seismic energy released on the island of Ischia in history...and was the first earthquake after the unification of Italy (1860). 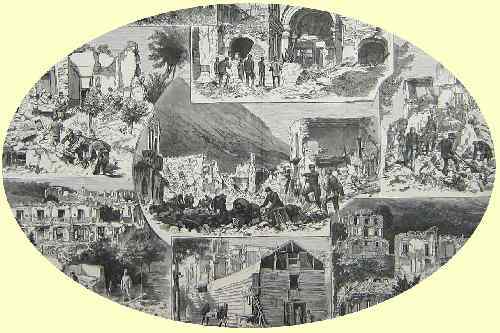 For the first time the new government issued codes for antiseismic prevention..."
The illustration (above) is from The London Illustrated News (Aug. 1883) to accompany their feature on the earthquake at Ischia. Here are two contemporary accounts of the event from the New York Times. July 30, 1883 in NYT— A FRIGHTFUL EARTHQUAKE; THE TOWN OF CASAMICCIOLA, NEAR NAPLES, DESTROYED. THREE THOUSAND PERSONS SAID TO HAVE BEEN KILLED AND AS MANY MORE INJURED — ISCHIA ISLAND TERRIBLY SHAKEN. [from] LONDON, July 29—The town of Casamicciola, on the island of Ischia, near Naples, in Italy, was almost totally destroyed by an earthquake last night. The terrific shock was first felt about 9.30 o'clock, when a majority of people of the upper classes were at the theatres. Intelligence from the ruined town comes piecemeal, but each successive dispatch adds to the horrors of the calamity. Almost all of the houses in Casamicciola, it is said, were thrown down, and it is believed that at least 3,000 persons were killed and nearly as many more injured. All estimates of the numbers of dead and injured, however, are necessarily imperfect. Some of the inhabitants of the town escaped to the sea after the first shock, and made their way to Naples with the startling news. A gentleman who was staying at the Hotel Piccola Sentinella, and who barely escaped with his life, relates that he only had time to secure some candles to light him through the darkness of the ruins before the building went down. The hotel, it is said, sank into the earth and buried many of its inmates. The center of the area of this shock was the same as that of two years ago, but the radius was much wider. The shock was felt miles out at sea, and also, it is asserted, by some of the people residing on the outskirts of Naples. The towns of Forio and Laccoameno, which are not far from Casamicciola, were greatly damaged. Large numbers of men, women, and children who escaped were conveyed to Naples by steamers, and their descriptions of the disaster are intensely interesting. According to the statements of many persons, the first shock was followed by an opening of the ground in many places, while in other places there was no movement whatever. Water gushed suddenly out of springs that previously had not been known. The walls of the large theatre, which was a wooden structure, were rent asunder, and hundreds of persons in the audience made their escape through the openings. Several boilers in the large bathing house burst, scalding and burning people who happened to be near them. A man who lived in the vicinity of the bathing establishment says that as he escaped from the place the walls fell close upon his heels, and he ran toward the sea shouting to the terrified people who were standing about, "To the sea!" To the sea!" The great excitement that prevails in Italy over this great calamity may be imagined from the fact that there were about 2,000 visitors in Ischia, including many wealthy Neapolitan and Roman families and several Deputies who were taking the baths there. Steamers loaded with the dead and injured are constantly arriving at Naples and the hospitals are rapidly filling with the sufferers. The public take no interest in anything else and each new batch of arrivals from the ruined town is eagerly scanned for identification. A dispatch from Rome announces that the Minister of Public Works has gone to Casamicciola to organize measures of relief. At Lacco there are many dead and wounded. At Forio the churches were ruined but no one was killed. At Serrara 15 were killed. The troops have recovered the body of Signor Fiorentini, Prefect of Lassari. All steamers plying between Ischia and the mainland were immediately charted by the government to bring the wounded from the island. ROME, July 29 — The Naples correspondent of the Bersagliere has telegraphed as follows: "I have just returned from Ischia. Casamicciola, Laco, and Forio have been destroyed. They were three of the most flourishing communes on the island, which was half overthrown. The road between the towns of Ischia and Casamicciola is impassable." The train from Rome to Naples to-day was crowded with passengers going to inquire as to the fate of their friends. There were very few English visitors on the island at the time of the disaster. None of the special dispatches mention American names among the killed or injured. None of the Deputies is known to have perished, and it is hoped that all have escaped. An English chaplain lost one child. A Mr. Green and wife are among those killed at the Hotel Piccola. Among the dead are Prof. Palma, the Baroness Diriseis, Commander Zapputi, the wives and children of Signori Cecere, Siciliani, Ali, and Martano. It is probable that the Marchioness Pacca Laurati is also among the dead. A Miss More was saved. NAPLES, July 30 — Prof. Palmieri, Director of the Meteorological Observatory on Mount Vesuvius, states that the disaster on the island of Ischia Saturday night was not due to an earthquake, but to the subsidence of the ground. The scenes here occasioned by the accident are heartrending. The hospitals are crowded with wounded survivors, and the dead-houses are filled with the bodies of the victims. The bodies of several Neapolitan ladies have been recovered from the ruins. Five houses remain standing at Casamicciola. Cries for help can be heard coming from the ruins. Sappers are hard at work endeavoring to rescue the persons who are still alive. Boats from the island filled with dead bodies are arriving here constantly. Many women and children are among the victims of the earthquake. Fifty wooden huts will be built immediately for the accommodation of the survivors. The municipal authorities of Naples are sending relief to the island, and are doing all in their power to alleviate the distress of the people. Moat of the corpses that have been recovered are so discolored by dirt that even after they have been washed the features are unrecognizable. All the members of the police force at Casamicciola were killed. A boat has arrived at Naples containing the bodies of 24 infants. A few persons were taken from the ruins alive last evening. Eight hundred more troops went to the scene of the disaster last night. Survivors say that 37 persons were entombed in a room in the Hotel Piccola Sentinella. Count Sergardi, after three hours' exhausting labor, rescued 11 persons, but failed to accomplish the principal object of his efforts—the saving of his sister. The play at the theatre on Saturday night was a burlesque, which opened with a scene representing an earthquake. Midnight. —Two thousand soldiers digging in the ruins saved 1,000 lives up to midday on Sunday, and exhumed 24 persons alive on Monday. LONDON, July 30. —Of the foreigners staying at Casamicciola only those were saved who were at the theatre on Saturday night. Survivors state that they were obliged to pass Saturday night in absolute darkness without daring to move even to assist those calling for help beneath the ruins. There is now little hope that the latter are still alive. Three soldiers searching for victims were fatally injured to-day. Subscriptions have been opened throughout Italy for the relief of the distressed. LONDON, July 31. —It is now stated as certain that 4,000 persons perished on the island of Ischia Saturday night. The stench from the dead bodies of human beings and animals is almost unbearable. Several men and women were rescued from the ruins on Monday morning. Many more might have been saved if a larger force of rescuers had been available earlier. Many persons who were heard groaning during the night were dead before they could be reached and carried to places of safety. ROME, July 30. —The Roman newspapers appeared to-day with mourning borders. Many of the people injured in Ischia will be cripples for life. The dead at Forio number 300, at Laccoameno 500, and at Fontana Serrara 200. Twenty-four children perished in the Misericordia Asylum. The King and Queen of Italy have subscribed 100,000 lire and the Pope 25,000 lire for the relief of the sufferers.